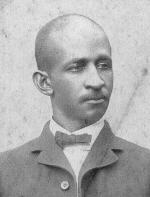 Caesar Carpenter “C.C.” Antoine is best known as a leading African American politician in Louisiana during Reconstruction (1863-1877). Antoine was born in New Orleans to a Black father who fought the British as an American soldier at the Battle of New Orleans (1815), and to a West Indian mother. His father’s mother was from Africa and the daughter of a captured African chief. Her reputed self-purchase from slavery and accumulation of a minor fortune allowed C.C. Antoine and his father to live out their lives as free blacks. Prior to entering politics, Antoine ran a successful grocery business in New Orleans. John Andrew Prime, “Lt. Gov. C.C. Antoine: Louisiana's 3rd Black Lieutenant Governor”http://home.earthlink.net/~japrime/cwrt/antoine.htm; Eric Foner, Reconstruction: America's Unfinished Revolution, 1863-1877 (New York: Harpers Perennial, 2002); W.E.B. Du Bois, Black Reconstruction in America, 1860-1880 (New York: Touchstone, 1995). John Andrew Prime, “Lt. Gov. C.C. Antoine: Louisiana’s 3rd Black Lieutenant Governor”http://home.earthlink.net/~japrime/cwrt/antoine.htm; Eric Foner, Reconstruction: America’s Unfinished Revolution, 1863-1877 (New York: Harpers Perennial, 2002); W.E.B. Du Bois, Black Reconstruction in America, 1860-1880 (New York: Touchstone, 1995).